Chen Dongfan, Half a Man - 30, 25.8 x 22.4 in., Acrylic and newspaper, 2017. Fou Gallery is pleased to announce that the new exhibition Chen Dongfan: You Know My Name, Not My Story is on view from April 1 to June 4 , 2017. This exhibition will present artist Chen Dongfan’s latest drawing series Half a Man, as well as a single-channel video installation In Bliss Until Eternity. While the Half a Man series continues Chen’s long-term exploration of portrait painting, it is also an homage to the late artist Mike Kelley (1954–2012). The opening reception of the exhibition will be held on Saturday, April 1 from 5–8 pm. The exhibition’s Chinese title “Luo Man Shi (罗曼史)” is a transliteration of the English word “romance.” In Chinese, this word is typically used to denote an anthology of romantic stories or a technique of narrating romantic stories. However, if viewers expect romantic stories from the artworks because of this title, they might be disappointed by the artist’s next message: “You will never know my story.” Chen’s refusal of explanatory narratives, in fact, expands viewers’ possible interpretations of the works. 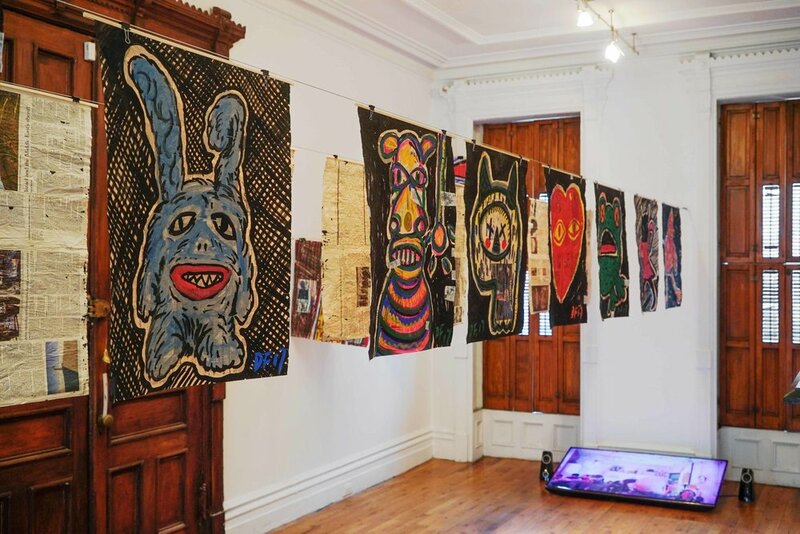 While the exhibition teases viewers with its playful manner, it also allows them to examine their preconceptions of various identities and to ponder the relationship between the artist and his social and cultural background. The Half a Man series is inspired by Chen Dongfan’s visit to Mike Kelley’s 2012–2013 retrospective in Amsterdam. One of Kelley’s works entitled Ahh… Youth! (1991) was the main source of inspiration for Chen. This group of eight Cibachrome prints of mug shots features thrift-store stuffed animals and a faintly sociopathic portrait of the artist himself. As an artist who frequently crosses the boundary between high art and low art, Chen combines popular culture with a classic painterly sensibility in his work. 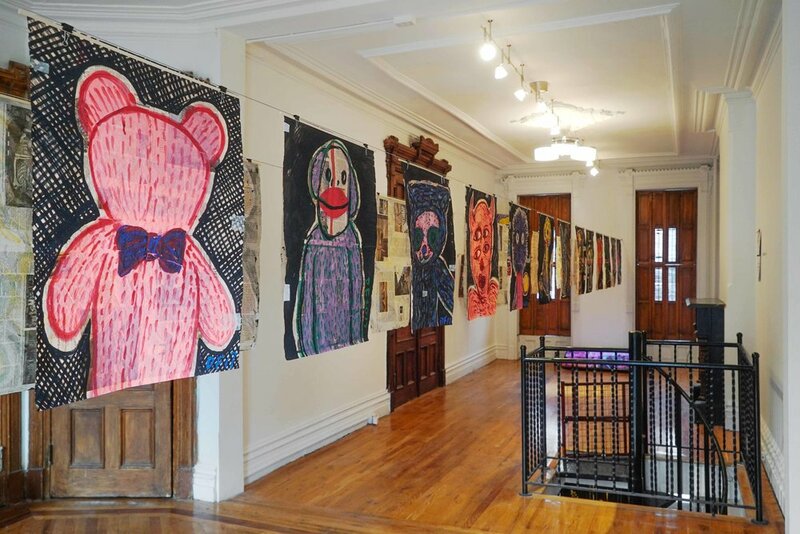 In the Half a Man series, he applied bright acrylic pigments using a graffiti-like and decisive brushstroke on crumpled newspaper to depict thirty different stuffed animals’ portraits. He intentionally creased the newspapers and then ironed them flat, enriching the texture and emphasizing the process of making art. In Western painting tradition from the Renaissance period, portraiture is second only to religious subjects. Those depicted in portraits usually have distinguished reputations or have performed heroic deeds. In Chen’s work, the subject of these portraits are stuffed animals with vibrant, dark characteristics, like scars from stitches or even sexually suggestive poses. Chen also invites the viewers to name the stuffed animals and write their stories. During this process, the stuffed animals become protagonists of the show while their stories are continually redefined and reexamined by the viewers. The stuffed animals on black background sit in awkward positions, revealing complex emotions such as ambivalence, insecurity, and loss. Often regarded as a representation of childhood innocence, the stuffed animals in this show appear to be strangely mature. The Half a Man series is a reminder to the grown-ups: The loss of innocence through the process of growing ultimately leads to a change in our perceptions of and thoughts about the world. *The press release is written by Yiwen Han, translated by Feiran Lyu and edited by Mike Fu. This exhibition is supported by Inna Art Space, Hangzhou and New York.